A Tilt and Rotate valve is included in the base configuration of the SimpleCoat TR along with the robust 3-axis motion platform. Station 1 can tilt ±45° and rotate ±90° giving you full access to all sides of your device. 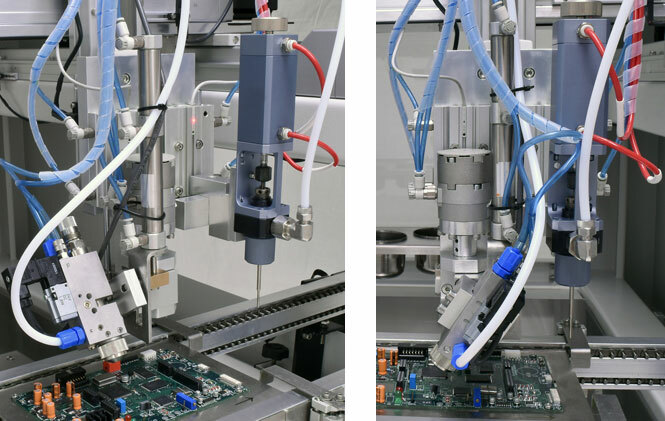 SimpleCoat TR is ideal solution for selective conformal coating and dispensing applications that require a high level of accuracy and repeatability. It is an ideal solution for medium and low volume. This conformal coating machine works with a customer-supplied laptop computer. Programming is easy and can be done either by manually teaching a program or by using a JPG image of a PCB. All dispense and motion parameters can be easily altered with the easy-to-use interface. Various shapes, patterns, and areas can also be programmed.